If your home is heated by a combustible fuel such as gas or oil, and if most of your electricity is generated from hydro, then it may be well worth considering switching to electric space heating. Perhaps you have an inefficient older furnace and you have been considering upgrading it, but are hesitant due to the large capital investment. You might be surprised to find that if you turn off your furnace, a couple hundred dollars worth of portable electric space heaters can get you through the winter and pay for themselves in reduced heating costs in the first year alone. Combustion based heating systems are inherently inefficient compared to electric space heating. Here is a simple calculation you can do to determine the “critical efficiency” below which it makes economic sense to switch to electric space heating. First, determine your actual cost per kWh (kilowatt hour) of fuel. Call this value “A”. You may need to convert from some other unit of measure. For example, my home was designed to be heated with natural gas which is measured in GJ (gigajoules) on my statement. A quick internet search shows that 1 GJ is equivalent to 277.8 kWh. If possible base the value of A on actual statements, not advertised costs. In other words, A equals your total cost of fuel for a year divided by your total consumption in kWh for the same year. For me A worked out to about 0.043 $/kWh. Next, determine your actual cost per kWh of electricity consumed. Call this value “B”. Again, use your actual cost of electricity for a full year divided by your total electrical consumption in kWh for the same year. For me, B worked out to about 0.071 $/kWh. Next, recognize that A is not your “TRUE” cost. In any combustion based central heating system, some of those kWh of energy that you paying for never make it into your home. Much of the heat simply goes up the chimney. Some newer furnaces approach 100% efficiency but the heat distribution system still has losses compared to electric space heating since electric space heating puts heat exactly where you need it while central heating systems heat up non-living spaces which then dissipate additional heat to the outside. Thus a central heating system will always have a lower efficiency than electric space heating in the same home.Â If you take A and divide it by B you get your “critical efficiency”. If your combustion heating system is less efficient than A/B then you will save money by switching to electric space heating. My critical efficiency was about 60%. How do you determine the efficiency of your combustion heating system? About the best you can do (without actually switching to electric space heating temporarily to compare results) is to make an educated guess. The efficiency of newer furnaces is often indicated right on them. However, as mentioned above this is only the efficiency of the furnace. You must also take into account the efficiency of the heat distribution system. If you have an 80% efficient furnace, with forced air distribution, you might assume 70% overall efficiency compared to electric space heating.In my case I guessed that my gas furnace and forced air heating system, having been built and installed 30 years ago might be around 60% efficient. This is the same value as my critical efficiency. Therefore, it seemed questionable whether I would realize a benefit from switching to electric space heating. In the name of science, I was willing to take the risk. Based on your previous year’s fuel statements, you can determine the maximum continuous power you’re likely to need to heat your home. For example, I knew from previous gas statements that the most gas I ever consumed in one month was about 16 GJ or about 4445 kWh. Dividing that by 720 hours per month gave me a maximum continuous power output of 6 kW. However, this is an average over an entire month. Peak power requirments could be higher on a day to day basis, so I multiplied by a factor of 1.5 to get 9kW. This is based on gas heating though, so factoring in my estimated 60% efficiency, I figured I should only need about 5.4 kW of peak power output from my space heaters.I did not want to draw too much power from any one circuit in my home. A typical 15 Amp circuit can only drive up to 1600W before you risk tripping the breaker. Allowing for other electrical loads on any given circuit, I decided I did not want any single space heater to draw more than 750W. Thus I needed around 7 space heaters, each connected to a separate circuit in order to get the 5.4 kW of total heat output I wanted. I was in no hurry so I watched for sales and ended up picking up six 750W heaters for $25 each and two 1500W heaters (with a half power setting) for $40 each. These were oil filled radiator style heaters like the one shown to the right. I chose this style because it is completely silent (another benefit over forced air systems). I heated my home for an entire winter with the 8 space heaters described above. Comparing my energy consumption and costs to the previous winter I found that I saved about $350, easily covering the cost of the heaters. What’s more I determined that my gas heating system was actually less than 50% efficient compared to electric space heating. It’s important when comparing two different years to account for possible differences in outside temperature. To see how this is done and for more detailed data from my comparison over two consecutive winters, see Comparing natural gas vs electric heating. I also compared green house gas emissions. At first, I did not find my home very comfortable using electric space heaters, but things quickly improved. There is a bit of an art to getting an even temperature distribution. Effectively each heater has two variables you can control: it’s location, and it’s thermostat setting. With 8 heaters going simultaneously, that’s 16 variables to play with.I found that the most even temperature distribution could be achieved by placing the heaters near exterior walls, especially under windows. That may sound wasteful since the heat has a shorter path to exit the home, but it is the only way to get even temperature distribution. If you locate the heaters far from outside walls, the temperature will drop sharply as you move away from the heater towards the outside walls. The best method I found for adjusting the thermostats was to set them to their maximum and wait for the room to heat up a couple degrees above the desired temperature. Then I turned the thermostat down until the heater just turned off (indicated by a barely audible clicking sound). This thermostat position would typically result in the room cooling down a couple degrees and then holding at that temperature. 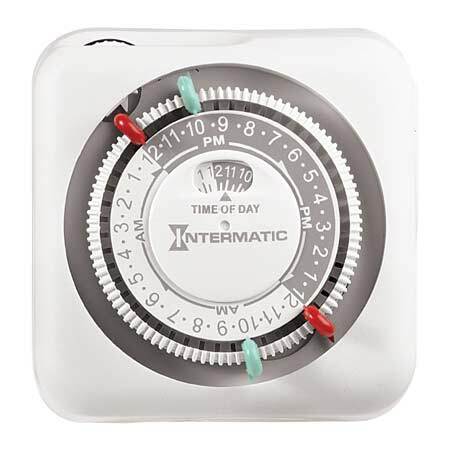 If you are accustomed to using a programmable thermostat for your home to set back the temperature while you are away, you can implement a similar system with electric space heaters simply by plugging them into mechanical timers like the one shown. However, be aware that if the heaters are off for a particular fraction of the day, then the peak power output you need increases by the same fraction. For example, I determined I needed a maximum of 5.4 kW of power output to heat my home. If I turned my heaters off for 1/2 the day, then I would need a maximum of 10.8 kW of power while the heaters were on. Yet another benefit of electric space heaters is that you can “program” each space independently. For example, I work at home, so I can heat my bedroom at night but not during the day and I can heat much of the rest of the home during the day but not at night. It takes some time to bring a room up to temperature. Be sure to adjust timers to start heating earlier than when you want a room to be comfortable. Trial and error will suggest an adequate preheating time. It’s not necessary to invest in 8 space heaters all at once to see if electric space heating will work for you. A great way to test the waters is to buy just a couple heaters and run them in parallel with your central heating system. If you perform this test at the beginning of or end of your heating season, the space heaters will likely be providing most of the power to heat your home. The thermostat for your central heating system will automatically reduce its contribution. You can then compare a month of operating with partial electric heat to a previous month of operating with only your central heating system. Be sure to compare months with similar outside temperatures (or normalize the two costs by dividing by them by the actual average temperature difference maintained between inside and outside during each month). If partial electric heating reduces your “cost per degree”, then purchase more heaters and turn off your combustion based heating system completely. You’ll notice that in the very first paragraph, I said you should consider this if your electricity is generated from hydro. That’s because electricity generated from hydro results in far less greenhouse gas emissions per kWh than any combustion process. Switching from heating your home with a combustible fuel to heating your home with hydro generated electricity will significantly reduce your carbon footprint. However switching to heating your home with electricity generated by a combustion process (ex coal fired power plants) will likely increase your carbon footprint. Chances are good it won’t make sense economically either. In any case, I recommend switching to electric space heating only if your electricity is generated by hydro. Many readers have asked me if I have considered installing a heat pump. I have considered it and I am still considering it. Whether it is better or not depends on your definition of better. It is certainly better for the environment, but it involves a high capital cost, a significant amount of work, and many years till pay back (even with govâ€™t rebates). Is it worth it? Yes. Would I expect an average reader to switch to a heat pump because I said so. Not likely. If you can afford to switch to a heat pump (or even a high efficiency gas furnace) and you expect to be around to reap the benefits after the pay back period then by all means do it. But that is a big decision while switching to electric space heating is a no brainer (if you have an old, low efficiency gas furnace like mine). It costs a couple hundred dollars, takes almost no time to set up, pays for itself in a single winter and you can take the whole system with you if you move. I heard that space heaters are a big fire hazard. What can be done to reduce the risk? 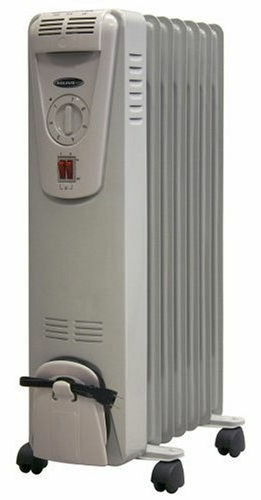 Due to a heat pump (a contradiction in itself) that fails to provide warmth when it is needed most (when it is coldest outdoors), I heated my entire house last winter using three space heaters. There is about 1800 sq. ft. of space that we actually use. My home is built tall (2 stories with a basement) instead of long. I mention this because I feel it is important to consider the way your home is laid out to help in determining how many heaters you will need. If your home is taller you probably won’t need but a few heaters. I purchased a Honeywell heater that blows warm air. I use this one in my bedroom, using the lowest setting and the temperature is perfect. If I crank it all the way up, it is downright toasty. The living room/kitchen is warmed by a single “Comfort Essentials” (purchased at Wal-Mart) ceramic rod heater with a blower. It works wonderfully (placed under one of the living room windows). It is 69 degrees according to the thermostat on the opposite wall. It is 28.7 degrees outside as I write this. The upstairs is heated using a DeLonghi oil-filled heater (that looks like a radiator) which is placed in the upstairs foyer. I saved about $110/month last winter on my electric bill. I didn’t need to do a lot of calculating to determine that this was a much more efficient way to warm my home. I paid about $30-$40 for each heater. They paid for themselves in only one month. This past summer I found that 2 small window AC units (the small ones, no less, placed in the upstairs bedrooms) cooled my entire home with the help of my central air fan circulating the air. I don’t believe I’ll ever use that “heat pump” again. My power bill has gone down dramatically in the past year. With the economy as it is, we need all of the help we can get. Oil filled radiator style heaters with no fan are the safest. They provide a large surface area at a relatively low temperature. Even at their maximum power they are not too hot to touch. The only likely way one could cause a fire is if you draped several blankets over it, insulating it and thus allowing the surface temperature to rise. Good ones have a thermal shutoff that will disable the heater if it gets hotter than it should under normal conditions. Convection heaters are not as safe. They can overheat if something obstructs the airflow through them or stops the fan from spinning. The most common way air can be obstructed is if the heater tips over. Therefore good convection heaters include a sensor that turns the heater off if it tips over. That is a good feature to look for. I would not be comfortable leaving a convection heater unattended for very long but I leave my oil filled heaters unattended all the time. The oil filled heaters are also silent except for an occasional “click” when the element turns on and off. I wish my home was built tall like yours. It is a much more efficient design with less outside surface area (especially ceiling area) through which to lose heat. I’m curious if your heat pump is an air-source heat pump or a ground-source heat pump. Air-source heat pumps are not as efficient since it’s much harder to extract heat from cold air than it is to extract heat from comparatively warm ground. The ground temperature several ft below the surface is relatively constant year round (about 12Â°C where I live). I am highly considering the switch from gas to electric. I’ve been doing the math and number crunching for quite awhile now, and your site helps re-enforce my beliefs regarding the cost savings of such a switch. I am also considering the oil filled systems for my entire house which is just under 800 sq. ft. I already own one, its 600-1500 watts adjustable. Are those 400 watt that I see all the time any good? Also I have a 2 ft. crawl space(if that)…..would my pipes freeze? Our house was originally heated by a wood heater in the “basement” and two electric baseboards in the dining/living room at the other end of the house (splitlevel). The former owner had replaced the wood box with a natural gas fireplace and a gas water heater. When we moved in we found the gas fireplace was not good enough. I also noticed that I was paying $10 per month for gas even when I was only using $20 to heat water. The water heater was converted back to electric (the wiring was still there) and I put a timer in to turn it off when not used. As you live in BC as well you may have heard that the cost of turning gas back on includes paying the $10 per month for all the months you have been turned off… even if you have been turned off for years! We won’t ever be going back as far as I can see. My hydro bill went up by less than my normal summer gas bill. The two baseboards have timer thermostats and in the bed rooms, I chose one outlet, put a hole in the wallboard directly above and ran wire from the outlet up. I put the same timer thermostat in that box and took power from the top plug on the duplex outlet to power it. I separated the plugs and the thermostat powers the bottom one. The oil filled heaters. I found setting them to 500w was good enough up to about 150 square feet. I get about 4 timed settings per day. in one room I took an electric “fireplace” and added a separate power cord for the flame display. I also made it a 750w heater instead of 1400w. The heater plugs in the bottom thermostat controlled plug and the display in the top… I will put a small timer in there… someday. The CFL lamp lasts longer than the incan bulb it came with. I bought the two Danby freezers this summer. Thanks for the advice; I have shared it with a few people. I have a 40 year old furnance in a BC Box House. I am going to use oil filled heaters this year. Lancaster has a 700 W small heater, Canadian Tire are selling for $25. This is a lot less surface space and less oil than the Nova 700/800/1500 7 fin model $56. Have you any predictions about which heater would be most economical. There are two things to consider. The first is that if you use two 1500w or three 700w heaters on the same circuit, you will blow the breaker all the time. You may find you can get around this by trying different outlets in the same room for different circuits. However, I have found that 500w is enough to keep up to about 150 square feet warm… in fact I think that the fins on the oil filled heaters are actually 200w each so my 5 fin 1000w heater on low is probably only 400w. My 1400w heater says it should be able to heat 400 square feet. So most rooms are a lot smaller than that… use the lowest setting there and buy one where the lowest setting fits your needs… and your breaker box. Because we started out with some baseboard heaters and a 60amp sub panel in the garage, we have a 200amp panel. A lot of gas heated houses have only 100amp or even only 60amp (if the stove is gas too). Which ever one you get, try to place it in plain view from where you sit so that your body can take full advantage of the radiated heat, just as you would sit facing a fireplace for example. Put the wide side towards you. This is in my opinion one of two pluses for the oil filled heaters, the other being that it does not burn the air (or the dust particles in the air) and give that scratchy throat feeling. the panels are marked. labeled. when you are looking at them there are two rows. depending on the brand, determines where the phases (two halves) are located. square D – each breaker side by side – are on different phases. the breakers across from each other are same phase. federal pioneer – very tough – should get help with this type as there is a pattern they follow. usually the first two side by side are different phase. the second and third breaker are same phase. the third and forth breaker different phase ect. Get Help. if you are Not qualified – don’t try. bad things happen to good people. but breakers across from each other, same phase. sylvania – most i seen are like sqr d – side by side – different phase. across from each other – same phase. anyways, point is to share the load on the panel. i say this because it is possible to place enough electric load on one phase that when you electric cook, or electric cloths dry, the main will “pop”. you could enough amps/watts on one side to blow main breaker (now where was that flash light again). 80-90amps one side vs 20 amps on other phase. try for 50 – 50.
gas doesn’t have this problem.